Scenes with a silhouette is our challenge this month and we have seen some wonderful projects entered already. You have three more weeks to create your special scenic project with a silhouette. 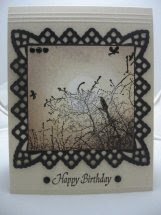 Our sponsor this month is Carolines Creative Stamps. She has offered us £15 to use in her store. Don't forget, you may enter up to three creations for each challenge. This week we have new eye candy from Anja and Nancy. Keep on creating! We will see you next Sunday with more silhouette projects to share. These are wonderfully designed cards. Thanks for the inspiration.